Like any other activity, the motorsport world has more than its fair share of gossip. Like any other rumour mill, there is often little or no basis other than the whims of individuals. Of course with social media, these tales can circulate like wild fire. Sometimes though, where there is smoke, there is fire. 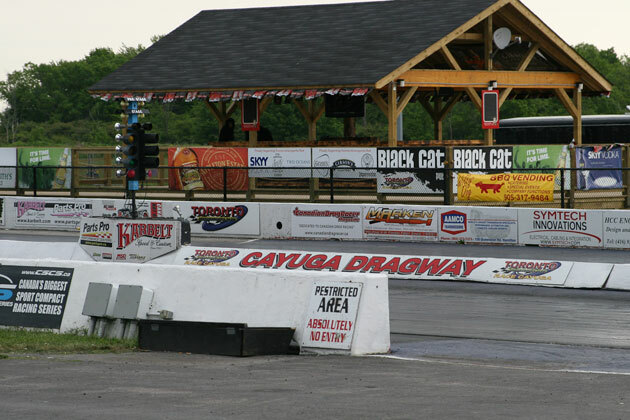 There has been much speculation as to what changes are coming to racing in Ontario since Mosport since Ron Fellows and partners purchased that track, along with questions about what series will race there next season. Likewise, there has been an on again, off again push to build a huge oval track in nearby Fort Erie which is slated to open in a year. It only seems natural then that people might wonder about the future of Toronto Motorsports Park and the rumours began to fly on Facebook. Click past the jump to continue reading. Like many race tracks around the World, Toronto Motorsports Park began life as a WWII air field, used for training pilots. In 1955, the Kohler Airstrip began seeing use as a drag strip on Sundays. Over the years, the facility changed names and owners several times until it was purchased by long time racer Uli Bieri in 1997. In 2000, Bieri constructed a 3.0 kilometre road course alongside the NHRA-sanctioned drag strip. 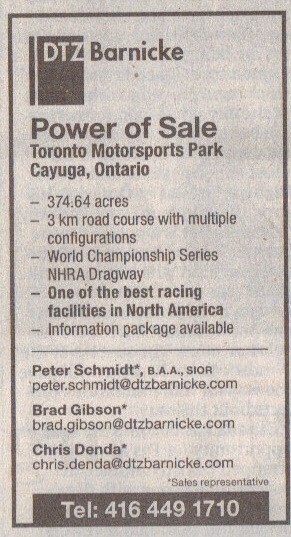 The following year it was renamed Toronto Motorsports Park. With several possible configurations, the track is perfect for drivers of every skill level from beginners to pros. Despite grilling our connections in the Canadian racing world for any info about a sale, nothing materialized. We decided to go right to the source and left a message for current-owner Mr. Bieri. Speaking by phone this morning, track owner Bieri told me that TMP is in no way up for sale. Like anything, he would consider selling if someone approached him with an offer, but it is not for sale. In fact, Bieri is making plans for the future. This past summer, work was completed on a new motocross racing track on the property, which held its first race at the end of the season. Likewise there has been bike racing on the road course, with discussions for possible future events for the 2012 season. He even has hopes for some small bore vintage car racing. As it stands right now, the track is active with lapping/testing activity almost seven days a week. He again reassured me that TMP is not for sale. Moments after we said goodbye to Bieri, we received a scanned copy of a Power of Sale ad from yesterday's Globe and Mail. A bit of confidential background digging has revealed that Bieri's financial backers have lost confidence in the possibility that they will recoup their investment and have pulled the plug on the former racer. This is not the first time that Bieri has had financial problems in the public eye. Back in the early 90's, Bieri's Scarborough based exotic car dealership's financial practices were investigated by the RCMP. That investigation led to Bieri's arrest and the loss of his OMVIC license which allowed him to sell automobiles in Ontario. Having been through an automotive PR nightmare once before, it is a bit of a surprise that Bieri would choose to take this approach. Either way, we will report on the news as it happens.